Lib Dem leader Charles Kennedy has accused the Tories of desperation as they signalled that immigration would be central to their election campaign. Conservative leader Michael Howard has used a full-page advertisement in the Sunday Telegraph to trumpet plans for a limit on immigration and asylum. In the advert the Tory leader says millions wanted to move to Britain but it "cannot take them all". He promised 24-hour security at ports to combat illegal entry. Labour says there are legitimate concerns about illegal immigration but argues the Tory plans are "unbelievable". Mr Kennedy told BBC One's Breakfast with Frost: "It is another indication of the desperation within the Conservative Party as the general election looms large." Migrants helped to stem skill shortages in public services, he argued, and people should not ferment an "artificial debate" on the role of immigration. Mr Howard's own father fled from Romania to south Wales in 1939. In the advertisement, signed by Mr Howard, the party leader said: "Britain has always offered a home to genuine refugees and to families who want to work hard. "I know - my family was one of them. We are a more successful country as a result." But he added: "Our communities cannot absorb newcomers at today's pace. Immigration must be brought under control. "It is essential for good community relations, national security and the management of public services." The Conservatives say that, based on government forecasts, Britain's population will increase by 6.1m during the next 30 years and immigration will account for 84% of that. They say net immigration to the UK has averaged 157,000 a year for the last six years - the equivalent of a town the size of Peterborough. Their plans also include a curb on work permits through an Australia-style system where points are awarded for work experience, qualifications and languages. "Genuine refugees" - perhaps about 15,000 a year - as well as people wanting to join their families in the UK, would also be allowed entry. The broad plans were unveiled last year but Mr Howard will give more details in a speech on Monday. Current work permits are given if a UK company can show an immigrant worker satisfies the criteria for one of a variety of schemes. Speaking on GMTV's Sunday programme, Mr Howard rejected claims of a "lurch to the Right", saying leaders of ethnic minority groups also wanted action to counter the dangers to community relations. But Refugee Council chief executive Maeve Sherlock branded the Tory plans as "dangerous, ill thought-out and hugely irresponsible". She asked: "Are we seriously going to tell someone fleeing torture at the hands of Mugabe's secret police, 'Sorry, we've filled our quota for this year. Come back next year'?" 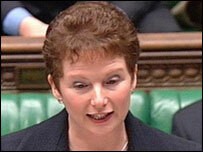 Home Office minister Hazel Blears said the Tories' planned £35bn spending cuts would prevent them delivering their promises. She added: "Everybody agrees with controlled migration. That requires investment in both effective border controls and immigration systems. 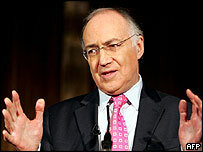 "Michael Howard's words and the Tories' spending plans are at odds. It's another example of their sums not adding up." The UK Independence Party accused the Tories of pandering to the anti-immigrant vote while refusing to recognise they were powerless to override European Union asylum policies.